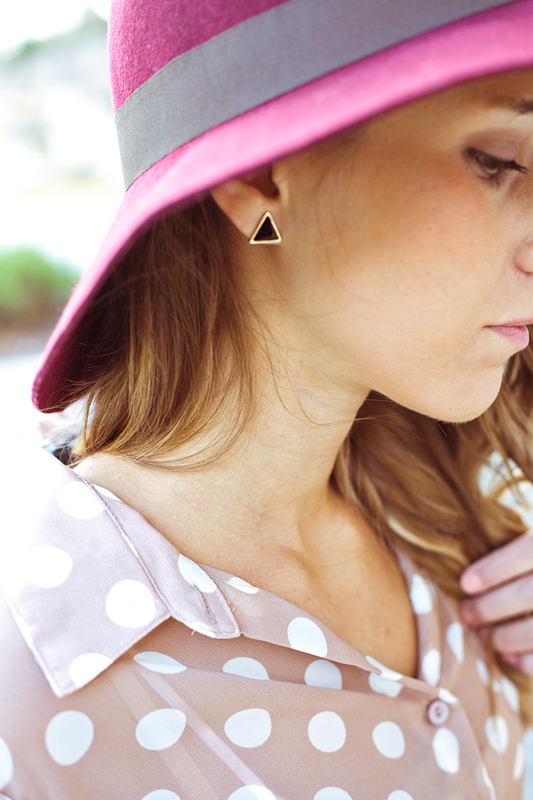 If you haven’t noticed, Twenties Girl Style got a little face lift this week! This revamp is thanks to the lovely and talented Joyce over at Joyful Outfits. I seriously adore it and am excited that my blog actually looks like a blog now…thanks Joyce!!! This week has been crazy. I guess thats what you get for getting an almost 2 week vacation. Getting back into the swing of things is always difficult after time off! The weather here has been so bipolar, transitioning from freezing to warm and breezy day after day. It’s supposed to warm up this weekend for good and be in the 70’s for Easter. Fingers crossed!! and yes, i am loving your new blog layout! Yerr bloggg looks awesommmmeee! *_* Haha think I could hire Joyce to redesign Trendy Teal? Love how the outfit you chose to debut the new blog layout with! The sheer blouse with tough leather skirt was a perfect choice. Also, I can see why you'd have trouble taking that hat off – so adorable! Seriously your outfit is super cute! I love it!!!! So pretty! I have a similar hat, and I feel the exact same way about it 🙂 I'm in love with your blog layout btw, it's perfectamundo! wow this outfit is gorgeous! and omg i must say i love the header of your blog! Beautiful as always! Hugs from Turkey! Oh heeeey, Joyce did an amazing job on your layout! It's so beautiful. I like the fresh, clean look. I bet it makes you feel like a whole new lady, huh, Ashley? 😀 hehe! So cute! I love the whole outfit! So in love with that hat! too cute. love the whole outfit. Such a clean and fresh look. I think I already mentioned it but that is the cutest hat ever! Love the color and it looks so pretty with the polka dots 🙂 And thanks for the shout out Ashley! The blog looks fantastic and so do you! 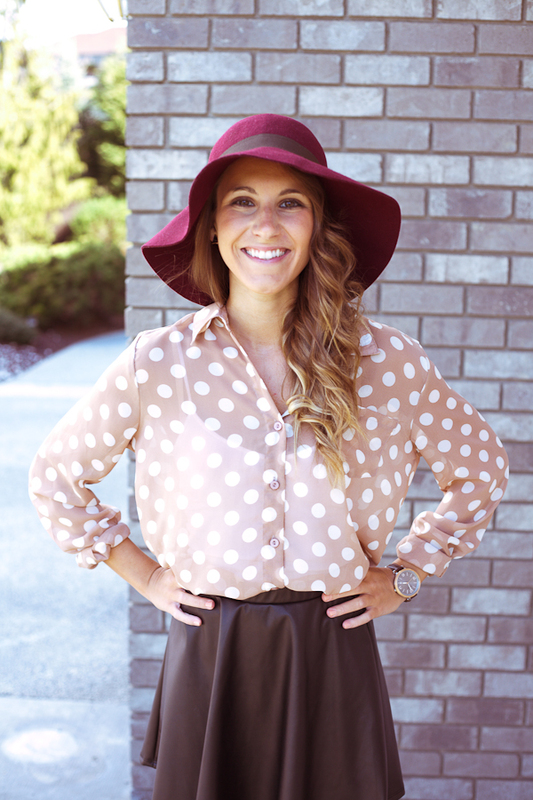 I love the hat and the polka dots! So cute! Love the skirt, and you look so adorable in that hat–it's a great color! Love the new look around these parts, too! Cute blog makeover! You look great in that hat girl! 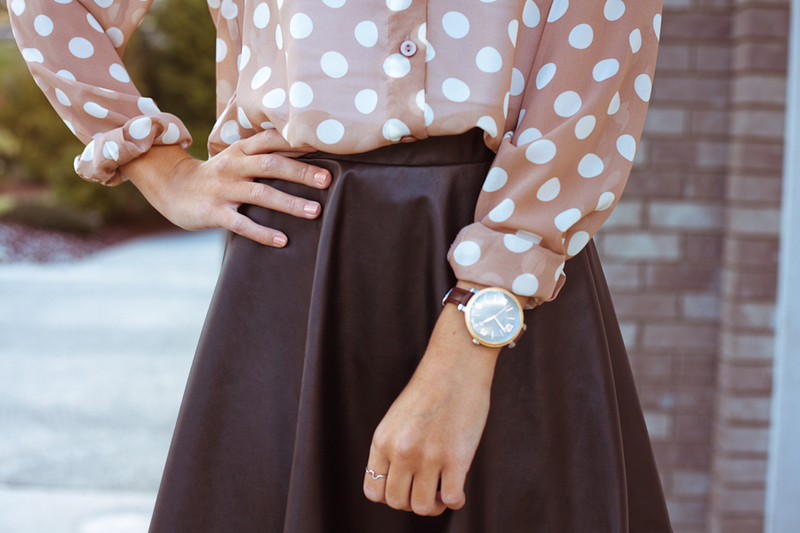 I'm in love with your polka dot blouse and you look adorable in that hat. lovely outfit girl.